Note as the expression is square “i” and “t” can be swap. Dielectric Fresnel’s formulas are always derive from conductor Fresnel’s formulas by settings . Several Fresnel’s formulas assume an Air-Dielectric/Conductor interface. Air IOR is 1.000293 and is approximate to 1. Thus using allow many simplification. We define and the ratio of indices of refraction at the surface interface. Fresnel’s formulas with , and can always be replace by Fresnel’s formulas with and . This formulation is really specialized for conductor and should not be used for Dielectric-Dielectric interface. (Note: For parallel case, “i” and “t” are swapped compare to equation in introduction to follow  notation. It doesn’t matter as the expression are square). If is imaginary, this indicates a total internal reflection and . 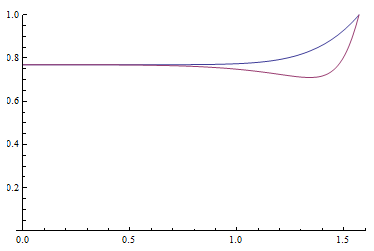 The Fresnel Schlick’s approximation  is widely used and knows (Call FresnelSchlick later) but its properties are not. 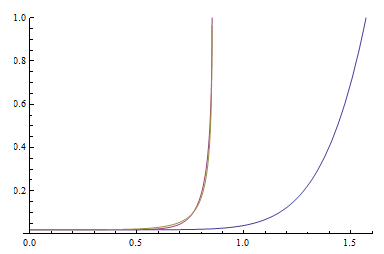 There is two possible versions of the approximation. However for complex IOR there is no way to retrieve the correct and . So in case of multi layer BRDF prepare to move to parameters with complex IOR instead of specular color. The accurate range still covers most use material in game (water at 1.33 still ok), so no need to worry too much about this. Example for dielectric-conductor which is the formulation provide in Lazanyi et al . The left figure show that’s the “dip” come from the perpendicular curve. 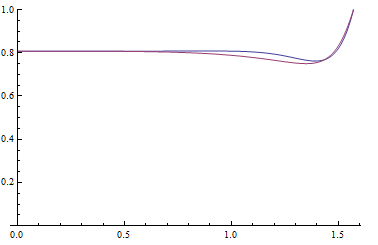 For dielectric, the perpendicular curve crosses the 0 line at the Brewster’s angle: . The reflectance does not reach zero for a conductor as it does for a dielectric, but the angle for which it is a minimum is called the pseudo Brewster. However there is no simple solution to retrieve it. That’s why the is difficult to get right as it should be related to this pseudo-Brewster’s angle which define the local minimun of the error term. Result is good, equation is cheap but only work for a particular case and need to be tune for each value (Remember that’s a metal IOR is chromatic and the process need to be done 3 times), so not really useful in practice. Anyway the visual impact of this “dip” is negligible and we can avoid it . With so much instruction the interest for FresnelSchlick start to decreases. 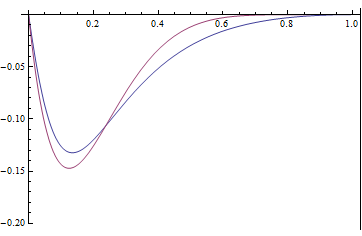 For an optimized FresnelSchlick formulation see Spherical Gaussian approximation for Blinn-Phong, Phong and Fresnel. The derivation for refraction vector can be found in . Optimized version of refract can be done for specific IOR, see Water drop 3a – Physically based wet surfaces. 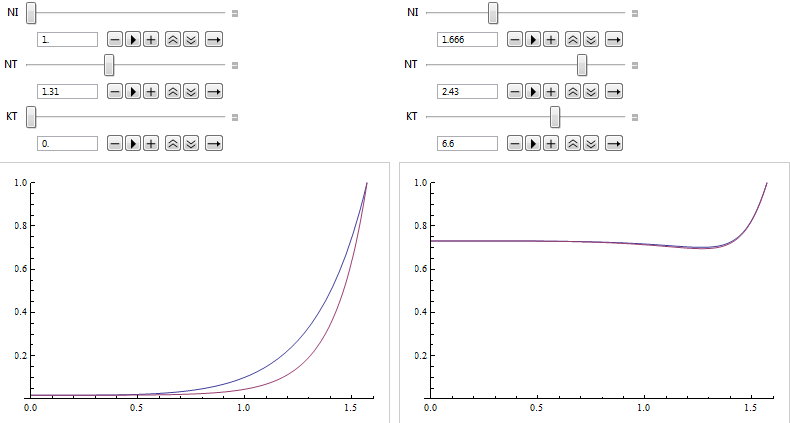 All the content of this post has been check in Mathematica. Here are the Mathematica files, one pdf: Fresnel and the notebook : Fresnel_nb (Right click, save, rename “.pdf” to “.nb” as wordpress don’t support zip files). Nice! Good to see all these data gathered in one place! Thank you for the great memo, it is really really helpful! I just would like to confirm is it ok to reference your code in our own projects or is there a copyright restriction or other similar restrictions? it appears there are some issues with Fresnel equations for dielectric-conductor and dielectric-dielectric interfaces that you’ve presented. Here’s my version based on Siegel’s Thermal Radiation Heat Transfer. They don’t match yours. Perhaps it’s worth double checking. Here’s the first set of equations (for conductors) further simplified to match the equations you posted. I posted the older version and I can’t edit the comment, sorry about that. You are right, thanks a lot for correcting me! Made a mistake when rewriting equation. So perpendicular case was right, only the parallel case was wrong. I have update the equation in version 1.4, thank you very much to let me know. Other part of the post shouldn’t be affected.